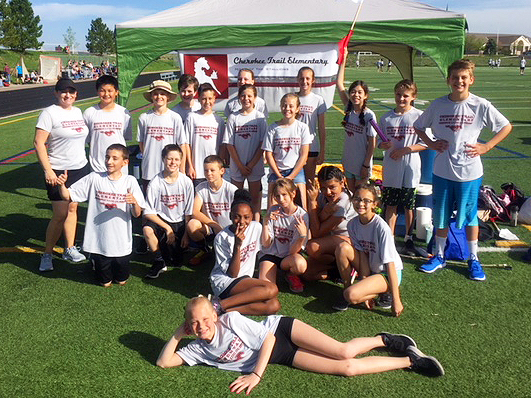 6th grade students competed at Chaparral High School on May 11th. CTE hosts its 6th STEAM Day. PSP NEWS School Supply Kits: Want to avoid buying school supplies this summer and have supplies delivered right to the classroom?? Then place your order for next school year by June 1st. There are additional items available like backpacks, lunch boxes, and more! All kits will be delivered directly to CTE prior to Open House in August. Restaurant Day at Swirls: It's our last restaurant day of the year next Thursday, May 24th at Swirl's, downtown Parker. You can go any time during normal business hours, 11:00am - 10:00pm, and let them know you are there to support CTE. Thank you to all who have attended restaurant nights this school year! You have helped fulfill many needs at our school. Lost & Found is really piling up!!! Please visit the CTE lobby and claim any lost items before they are donated to charity. It is time to sign up to volunteer for Field Day! Field Day will be Friday, May 18th for all grades. Activities will be before and after lunch (for all classes except 1/2 day kindergarten). School will not be out for middle and high school on this date so I really need PARENT and GRANDPARENT volunteers! Click HERE to sign up! Our Third Annual Volunteer Appreciation Celebration will be on Wednesday, May 23rd from 8:45-9:30. If you volunteered for CTE in any way or any time, at home or school, please consider dropping by for a continental breakfast so we can say thank you! Here's what's coming! May 18 Field Day May 23 Student Council, Film Club, EPIC Assembly May 24 Kindergarten Graduation May 25 LAST DAY OF SCHOOL! MAY 26 Happy Summer!